What can I say. I love to shop. Always have, probably always will. It’s definitely genetic. I started at a young age, following my Mom and Aunties around discount stores and outlet malls on illicit cross-border shopping trips. Buying up hordes of clothes at rock bottom prices, then carrying all the bags into the Denny’s bathroom on the I-75 to try and wear EVERYTHING back across the border in an effort to avoid duty charges. I have this clear memory – I was about 12. My mom wearing some Wham! knock-off sweatshirt that I bought, my aunt layered in 4 brand new leotards for her aerobics classes and me in a skirt with a pair of pants rolled up underneath. Scuffing the brand new shoes all the way to the car, the old ones long discarded in the Denny’s bathroom trash. The real moment of terror was when my sister noticed the pants rolling down under my skirt. 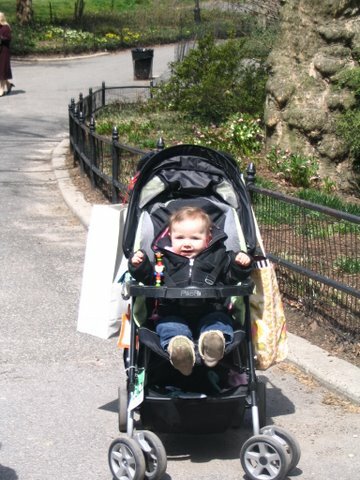 Shorty #1 in NYC with her Grandma – note the bags piled on the back of the stroller! We loved new clothes and nothing was stopping us from getting them. (Sh&# – I hope there’s a statue of limitations on smuggling seconds, overruns and deeply discounted clothes). My smuggling days are long past now. I always declare what I buy. But I still LOVE to shop. When I’m on the road, shopping is my favourite way to see a new city. I hate sitting around a hotel room, so if I have a window of time to head to the shops, I take it. I don’t have a particular fetish per se. It isn’t just shoes I lust after. It’s everything… with one tiny condition. It has to be on sale. Yes, my training as a professional shopper was ingrained with “you must get a deal”. So now, I may fall in love with the beautiful pair of Frye boots in the window, but if they are full price I have to walk away OR find them on sale some way, some how. Which has lead me to… the internet. I never dreamt that online shopping could be so fruitful. Yes, I am now on the mailing list for many online shops. My gmail inbox fills every morning with notices of discounts, special offers and warehouse sales. I lovingly sift through them looking for my favourite brands for me and the girls. Hoping to see those Frye boots discounted even just a little. Its so fun – the shopping is coming to me. I can shop from the comfort of my bed, coffee in hand. When the UPS man delivers that beautiful parcel, I can try the clothes on in the privacy of my own home (and lighting!). I don’t need to worry about wearing my fancy underwear in case the sales lady walks in the fitting room – I’m in my own bedroom for pete’s sake. Every now and again it doesn’t work and I have to ship the items back. But for now, I’m kind of into you online shopping.